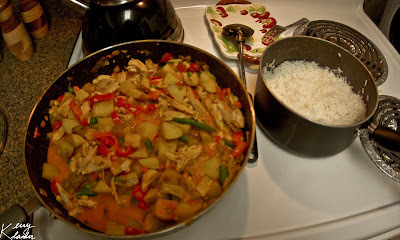 Dinner tonight is Red Chicken Curry. Yum! Cook potatoes until tender. Saute onion and peppers until soft. Add garlic, cook 1 minute. Add curry paste and cook 3-4 minutes. Add chicken, potatoes, veggies, and coconut milk, simmer 10 minutes. Serve over rice. Sounds yummy! Are you cooking the potatoes in the pan or boiling them in water? Fresh vegis or frozen? Pre-cooked or raw? When does the 1/2 cup of water go in? We microwaved the potatoes and then finished cooking them in the pan, but that was only because of time constraints. Preferably, I would have cooked them all the way in the pan. The mixed veggies were frozen, but fresh would definitely be better. Chicken was precooked- left over from another night's dinner. The water was added with everything else before simmering.